Nigeria has pardoned the former political benefactor of the nation's president, a presidential adviser said Wednesday, a politician convicted of stealing millions of dollars while serving as a state governor. The decision from a closed-door meeting Tuesday of the Council of State to pardon former Bayelsa state Gov. Diepreye Alamieyeseigha drew immediate outrage across Nigeria, an oil-rich nation long considered by analysts and activists to have one of the world's most corrupt governments. While the administration of President Goodluck Jonathan repeatedly says it is fighting the entrenched system of graft that strangles Nigeria, the leader has shared stages before with convicted politicians. Meanwhile, the country's largely opaque budgets and loose regulatory controls continue to allow for hundreds of millions of dollars more to be stolen annually. "It is the final nail that tells the story of fighting corruption in Nigeria today," said Nuhu Ribadu, a former police officer and corruption fighter who led the Alamieyeseigha case. "I'm really sad. I'm sad for my country." Alamieyeseigha served as governor of Bayelsa state, in the heart of Nigeria's oil-producing southern delta, from the nation becoming a democracy in 1999 through 2005. He was arrested in London after more than $1 million in cash was found in his home there. The disgraced governor later pleaded guilty. 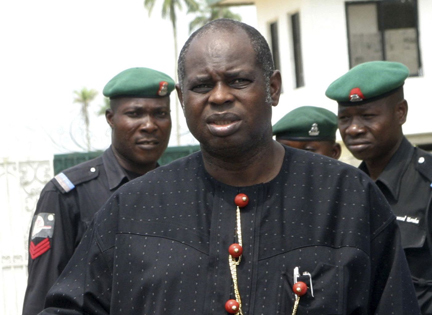 Alamieyeseigha's impeachment brought Jonathan, a little-known marine biologist who served as his deputy, into power. Jonathan as recently as a few weeks ago referred to Alamieyeseigha as "my boss" during an event in Lagos. On Tuesday, the Council of State, comprised of current and former leaders, as well as retired chief justices, approved Alamieyeseigha's pardon, Doyin Okupe, an adviser to Jonathan, confirmed on Wednesday. Okupe described the pardon as a group decision, though ultimately under Nigeria's constitution, only Jonathan has the power to grant it as president. The decision allows Alamieyeseigha to again serve in public office. "It is like a parent, it is not every decision a parent takes that is palatable or acceptable to the children. But in due course, we always find out the parents were right," Okupe told private broadcaster Channels Television. "The man has been displaced from his office as governor, he was hounded and tried and jailed. ... What is eminently wrong, you know, in giving a remorseful sinner pardon?" Okupe did not immediately respond to a request for comment Wednesday from The Associated Press. Others pardoned Tuesday included Maj. Gen. Shehu Musa Yar'Adua, a former deputy in a military government detained by late dictator Sani Abacha and who later died in prison under mysterious circumstances. Nigeria, Africa's most populous nation, likely lost more than $380 billion to graft between 1960 and 1999, Ribadu once estimated while head of the country's Economic and Financial Crimes Commission. Meanwhile, just more than 60 percent of Nigerians earn the equivalent of less than $1 a day, according to a study published by the country's National Bureau of Statistics. "There's not anything people can do anything to bring the people who are corrupt to justice," Ribadu told the AP. "It's a terrible development. I can't understand how leaders will sit down and come up with an unbelievable action like this."